Southern Magnolia is a beautiful large evergreen flowering tree that thrives in warmer weather. This tree is a staple of southern landscapes, growing to majestic heights of 60-80 feet tall. It is marked by extremely large, glossy, dark green leaves and large showy flowers. Because the standard magnolia grows so tall and wide one needs to have a large space available to plant it. This is a tremendous tree for a long term investment over many years, but it should not be expected to be a quick grower. The Southern Magnolia dominates its space wherever planted, producing fragrant flowers beginning in late spring through mid-summer. A showpiece tree even when not flowering, it is one of the most widely planted trees in the south. This tree likes full sun to part shade. It will grow in any soil, including clay. Two popular varieties of the standard Southern Magnolia are Brackens Brown Beauty and Little Gem. The appeal of these cultivars are their compact size and, in the case of Brackens, a variety that can be grown farther north. Brackens Brown Beauty extends the tree’s northern range to zone 6. The standard Southern Magnolia is hardy to zone 7. This is a big draw for gardeners in the Midwest area that would otherwise not be able to see this tree survive the winter. Brown Beauty grows to a height of 20-30 feet, allowing it to be placed in much smaller landscapes, yet still stand out as a specimen tree. The Little Gem Southern Magnolia is also a smaller version of the standard Magnolia. 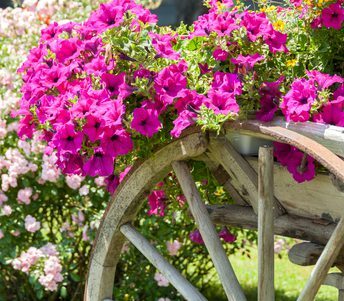 At a height range of 12-25 feet it can be planted in most landscapes from zone 7-9. 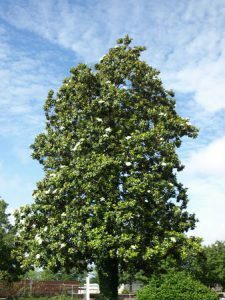 Consequently, it is the perfect specimen tree for many southern landscapes that cannot accommodate a full size magnolia.